The first milestone towards the big Orion 1.0 release is now available. The main focus of this release cycle is on cleaning up and polishing the work of the previous incubating releases, and much of this effort is in behind the scenes code that won’t make a big difference to the end user experience. However we still found some time to sneak in a few new features, as described below. Visit orionhub.org to check it out, or download your own server from the download page. A new settings page has been introduced that allows you to select or customize Orion’s appearance. 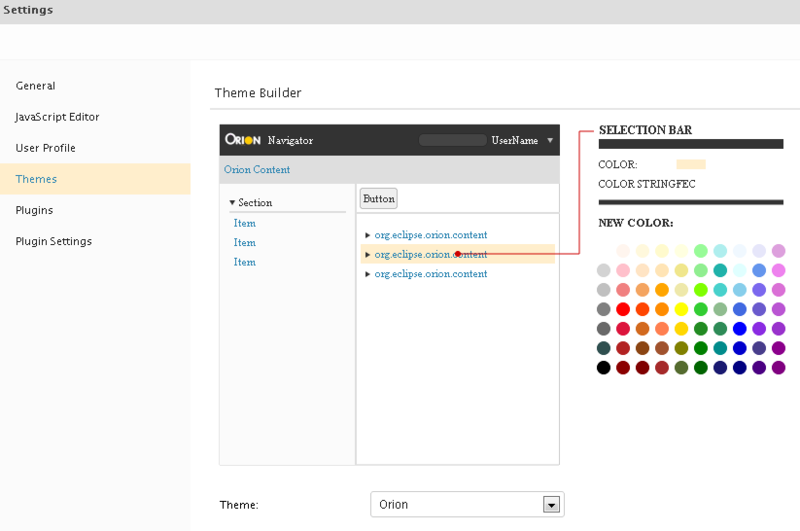 A drop-down list at the bottom of the page allows you to select from one of the predefined Orion themes. Individual color settings can be overridden by clicking on the corresponding area of the preview. You can give your customized theme a unique name to make it easier to switch back to later. Significant changes were made under the covers in Orion to support this easy visual customization of components. A major goal was to enable developers incorporating Orion components into their applications to easily customize the appearance to suit their needs. Styles have been streamlined and normalized across all Orion components, and work has been done to enable use of LESS to style components. 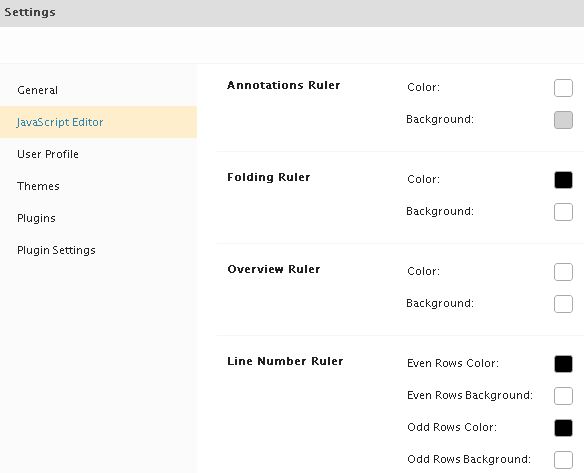 You can now customize the appearance of the editor rulers (gutters) from the Settings page. Plugins can now contribute their own settings via the new orion.core.setting service. The settings of installed plugins can be customized from the Plugin Settings section of the Settings page. A new action is available in the Navigator page to open the selected file directly in your browser. This is useful for viewing images or other files that don’t have a corresponding editor in Orion. Select the file to view, and click Raw from the Actions menu. The Find File command (Ctrl+Shift+F) now shows all file types rather than just text files. 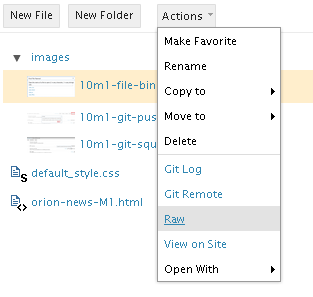 If the file cannot be opened in the Orion editor, selecting a file from the list will open the file in your browser. You can now search in file systems that don’t implement their own search, such as the HTML5 local file system. You can both search for file names using Find File (Ctrl+Shift+F), and search file contents using the search box in the top right corner of the page. This search is implemented entirely in the browser and may be slow in large file systems. When merging changes from another branch into the active branch, you can now choose to do a "squash" operation. This will merge all of the changes from the selected branch into the index (staging area). From there you can create a single new commit representing all the merged changes. There is a new option available when pushing a commit to select a different remote. This simplifies the development workflow when dealing with multiple remotes, which previously required several manual steps to push a change to multiple remotes. To use this option, click Push All from the Repositories page, and then click More to select a different branch or remote. 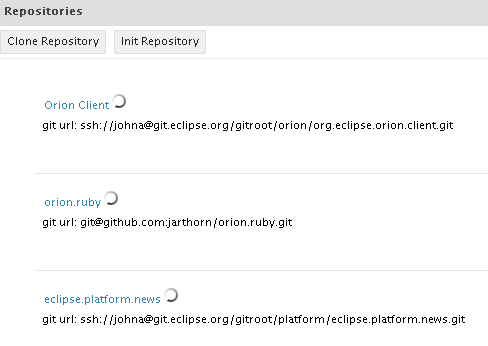 When viewing a commit in Orion, the Related menu now includes a link to the corresponding commit page on the remote repository such as github.com or git.eclipse.org. The Repositories page was previously slow to load when there were many repositories in use. The page did not display until all repository information was fetched. Now, the repository list is shown immediately, with further details fetched in the background and rendered when available. Many web sites and applications overcome this problem of quickly displaying information rich pages by using server-side page assembly techniques. In Orion we are avoiding tying into a single specific server technology, making it easier to reuse parts of Orion in a wide variety of deployment scenarios (embedded in native applications, offline use, etc). That’s all for this milestone. Enjoy!